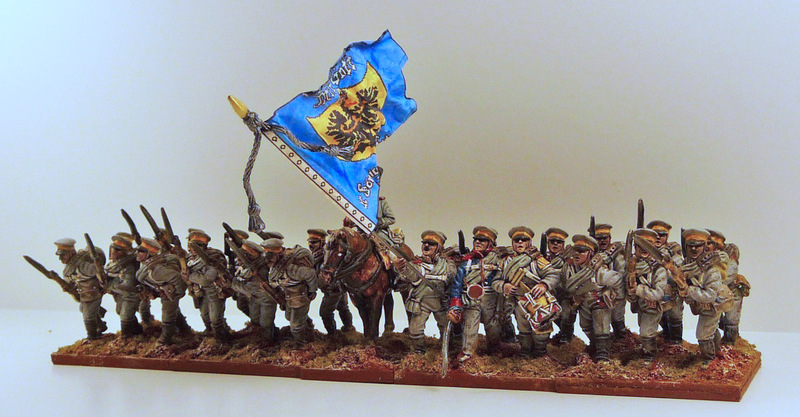 Here I hope is the start of my next army: The Prussians. 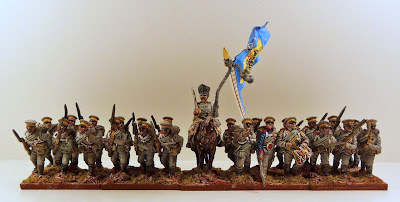 I had dabbled with the Prussians a couple of years ago when painted up a few small (12 figure) units of Wallmoden's Korps. This was my first introduction to Calpe figures and I have been looking forward to getting back to them. As readers of my blog will have noted, I have recently developed an interest in Les Cent Jours. I suppose when you have built a large British force, it is hard to abandon it. So with a good few French done, I felt Prussians would be a good idea. Lots of mini scenarios germinating in the old grey cells involving the Prussians at Placenoit, Wavre and Ligny. My recent success with the Lasalle rules in an asymmetric scenario have also encouraged me to press on. 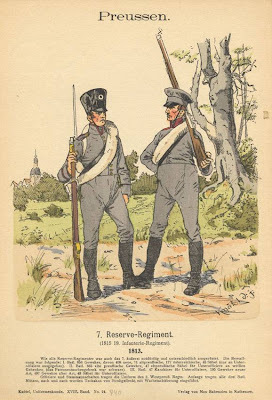 I had a look through the Prussian forces in the Waterloo campaign and was fascinated to see that many of the units that were in Wallmoden's Korps had been folded into the 1815 Prussian OB. Even more cool was the fact that it seemed that most of these units were still uniformed as they were in 1813. I wanted to start with a Prussian brigade with 9-10 infantry battalions and some artillery and cavalry support. 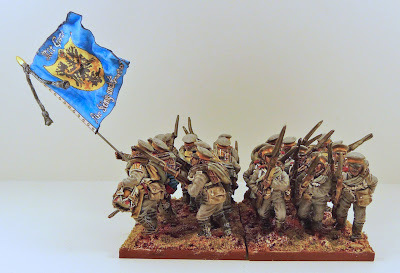 It felt it was a little boring to stick with the actual OB for a brigade, but rather to have any 3-4 units each from the original 1813 line infantry, reserve infantry and landwehr OB. 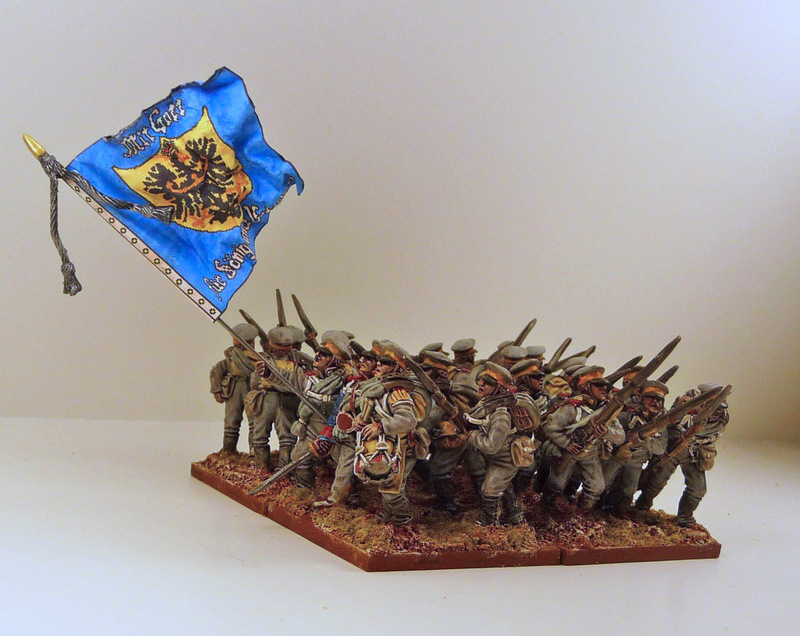 I suspect, since I have some of the units partially painted for Walmoden's Korps , we will see IR25 (von Lutzow's Freikorps), IR30 (Russian German Legion) and III/IR27 (von Reiches) in my Prussian brigade. Might even try to jam in IR28 (Berg in French Uniform). Certainly Lutzow's Hussars will also appear as the 6th Prussian Uhlans. Steven Summerfield's books as well as Les Cent Jours website were quite invaluable in my research. As most of you know, I try to build my units around the Lasalle army lists, I will start with the core list and slowly add infantry and light cavalry abteilung organic brigades. Well that is all very exciting and it is easy to get carried away. But back to the current post. Here we have I/RIR11 or I/IR23 in 1815. By 1815 this unit would have still had their grey reservist uniforms, aside from the officers. They should be in regulation shako, but I had these figures on hand with the peaked reservist cap, so they must of lost their shakos. The figures were primed white, followed by Citadel Fortress Grey for the uniform and Astronomican Grey (more blue tinge) for the overcoat rolled over the shoulder. Usual other colours, followed by AP Darktone (very thinned-thank you Roger), and a quick drybrush with the Fortress Grey. The yellow collars identify their Silesian origin. The flag is wrong (it is for a Landwehr unit), but it does look nice. I believe I may change over to Flag Dude, it is just so much easier to have the flag all set to go. Very nice, John! For some reason I've always liked the look of the Prussians in the soft caps. These Calpe's certainly look the business. I've been wrestling with the idea of starting a Prussian brigade and I think I'm going to take the plunge. Hey, on a further note: You should participate in our 'Napoleonic Spring-Thaw Painting Challenge.' Check out my blog and let me know if you're interested - happy to have you join in. Great, for communication and photos for the blog you can get hold of me through this addy: curtcampbell at mac dot com. These Prussian reserve look very nice! Look forward to seeing more of your efforts John. I agree with your choice of the Flag Dude - the realistic and animated flags really look the business on any unit! You could get away with Prussians in greatcoats for IR28 as they wore them over their white uniforms at Ligny (not a few would have perished from heat-stroke I reckon!) - another great source is Uffindell's 'The Eagle's Last Triumph' about Ligny. Calpe figures are the best around at present both in range and quality but I note that The Perry's are soon to put their plastic Prussians out - their models for them look fantastic. Something I am lacking in my Prussian army. I'll have to pull my finger out. A Cautionary Tale: The Green Cuirassiers!